One of the best things Christians are doing all over the country at the moment is organising and hosting General Election hustings for their local communities. Last time round, in 2010, 67 per cent of hustings were held in church buildings. These are perfect opportunities for churches to offer a neutral venue and show both the candidates and their communities that God and politics can mix. On Monday it was my church’s turn to put on such an evening, which I had the privilege of chairing. These events provide a rare opportunity for the public to see democracy in action and, judging by the hundreds of people arriving even before the doors had opened, there is certainly an appetite for it. I can’t speak for every other constituency, but the one thing that stood out as the candidates did their thing was that each one was there because they care about this country and want to see it thrive and prosper. Although some of the statements and party policies being presented were seriously flawed, there was passion and a desire for change for the better in abundance. That’s not something you often come across in a church, especially an Anglican one. If I was asked whether it would be easier to sort out the country or the Church of England, I’d be inclined to go with the former. This nation and the CofE have got a lot in common: both are in a bit of a mess, living in the shadow of better days; both need to sort out past failures which have caused serious decline; both have strong political divides; and both are currently strapped for cash. But whilst in politics there are plenty of people who want to do something to work towards a better future, I’m not entirely convinced the same can be said for the CofE. I’m not the first to say that the Church of England needs to ask itself some hard questions about its future. Nationally, Church attendance continues to decline year on year and while some denominations, particularly among the black churches, are seeing significant growth, this overall fall in numbers is mostly a result of the CofE’s aging congregations simply dying off and not being replaced. 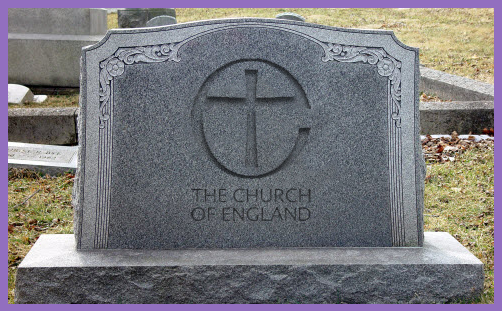 The bells are ringing out in alarm in the realm of Anglicanism, but too many would rather stick their fingers in their ears than let the din stir them into action. By way of illustration of Bishop Pete’s point, my church is an Anglican church which has seen its numbers grow over the years. Just like with any successful business, our leadership is fully aware that the bigger an organisation is, the more staff and volunteers it will need to keep it running and meet all the pastoral and structural needs. We have always been refused a curate because our church ‘does not carry out enough weddings and funerals’. So, instead, alongside our minister and lay staff, we have chosen to employ an assistant minister, fully-funded from our own income. However, being in the Church of England, permission has to be sought from the Bishop and Diocese before any appointment can be made. One might think that such a request would be enthusiastically received. Growing churches which can afford to employ additional staff are surely to be encouraged. But our experience is has been one of consistent discouragement. Because there is a shortage of ordained clergy in our diocese, our request has been deemed selfish and inappropriate. Other positions must be filled first, we have been told. This is frankly absurd, because clergy are not restricted to working in a single diocese for their entire life, and what has other churches’ inability to appoint got to do with ours? For more than three years, our church has been patiently waiting for a change of mind at the top. A new bishop has recently been appointed, but even with a change of direction we can expect to wait at least another year before anyone could be appointed. In the meantime, our current vicar is working a 60-hour week and is severely overstretched, making it all the more difficult for our church to put many of its plans for mission into action. Fortunately, this sort of situation is not the case throughout the Church of England. But often it would appear that those churches which are growing are doing so despite rather than because of the structures and hierarchy. If you study the Church in the New Testament, you’ll see that it grew rapidly due to the Holy Spirit working through men and women who were zealously mission-minded; committed to the teaching of the scriptures and radically counter-cultural. Jesus told his followers to go and make disciples. He knew the importance of discipleship. That is why He invested so much time and energy teaching and encouraging the chosen 12. He gave them and others a solid grounding in their faith that when the time came they were able to lead the Church and set the world on fire. However, as was pointed out during the Fulcrum event, prominent figures have been writing in the Church Times dismissing outright the need for discipleship in the church. Well, that’s fine if you want a multitude of church attenders who don’t know what they should believe and with no significant grasp of what it means to be a Christian. St Paul and the writer to the Hebrews are completely dismissive of this attitude, talking about believers still needing baby milk when they should be on adult food. But at least the Church of England is forcing itself to address growth and talk about it. People don’t magically start coming along to church and become Christians just because you want numbers to increase. It requires theological, spiritual and pastoral investment throughout the Church; not just at the top. Most of all, the Church needs to be put into God’s hands and that means allowing Him to do some potentially uncomfortable things which will disturb our sensibilities and challenge our attitudes and lifestyles. Bishop Pete, by the sound of things, is completely up for this, as are other bishops who are working hard to see growth happen. But, sadly, not all. Many believe that the biggest struggle the Church of England currently faces is its attitude towards and dealings with those who are LGBT. This is undoubtedly a great and pressing issue, but I believe that the biggest battle is actually for the CofE’s very existence. Decisions to be made over the coming years will determine whether the Church is taken in the direction of those who are happy to see it managed in steady decline toward oblivion, or of those who seek growth in both numbers and spiritual maturity through the work of the Holy Spirit, emboldening and sending out God’s people to take His kingdom into every pocket of our society to transform and bless it. Seeing my church full to the brim on Monday, and witnessing a group of people not afraid to stand up and declare what they believe, was wonderful to see. If politics and politicians can cause this to happen, surely faith in the Risen Christ can inspire far more?